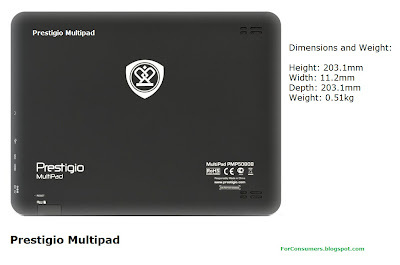 Prestigio Multipad review - today we are going to take a look at another affordable Google Android tablet. 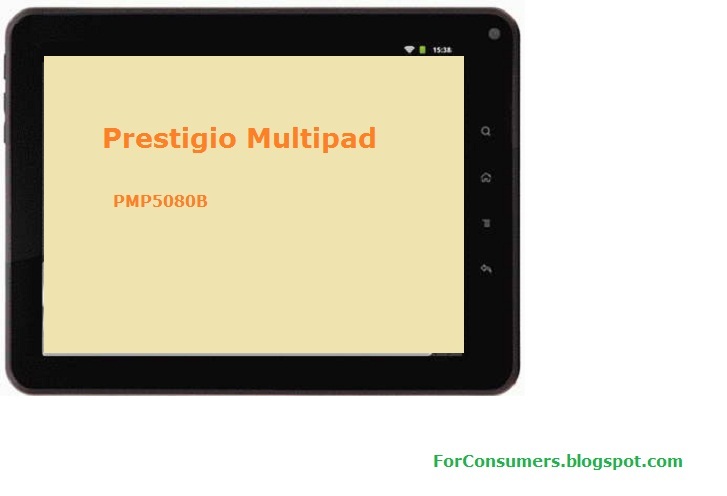 The 8-inch Prestigio Multipad offers average performance for a good price. The hardware performance of the Multipad is provided by the fast 1GHz ARM Cortex-A8 processor ( Rockchip RK2918) and the 512GB of RAM. The internal memory size is 4GB but you can expand the space for storage up to 32GB with optional microSD card. With the Prestigio Multipad you can enjoy watching films, listening to music, viewing your pictures or reading eBooks. The 8-inch high resolution touch TFT display gives you brilliant visuals and great touch input thanks to the capacitive touch screen. The 1GHz ARM Cortex-A8 CPU and 512MB of RAM gives you great performance and lets you get the best out of all your media. Your media can be stored on the 4GB internal memory, which can be expanded via the Micro SD Card slot. Connect to the internet via WiFi to browse the web or send and manage emails. With the Prestigio tablet you can stay in touch with family and friends wherever there is a WiFi access point. The included 2 megapixel webcam means you can have great quality video calls. Thanks to Android 2.3 Gingerbread you can enjoy various 3rd party apps, the Prestigio tablet even comes with preloaded apps and widgets to get you started. The tablet includes 3D graphic accelerator OpenGL 2.0, so you can enjoy playing 3D games and the G-sensor gives you tilt control. The slim, lightweight body and stylish design make the Prestigio tablet great for when you're on the move and a stylish leather pouch is included for when it's not in use. Listen to music with the built in speakers or use the 3.5mm headphone jack for when you're travelling. When you're at home and you want to watch a film or TV show, the Prestigio tablet can be hooked up to a TV or monitor via the HDMI slot. A USB cable and power adapter are included, so you can charge the device by a USB port or plug socket. - A.D. Yes it can, there are some pretty good apps for that in Google Play store. Prestigio Multipad hardware is good enough for such tasks. can you get the app for facebook and twitter? Can we download and use skype, instagram and adobe?